The Dell UltraSharp UP3218 is an absolutely stunning monitor that combines incredibly high resolutions with gorgeous colors. It’s also very expensive, and for most people the advanced features will go to waste. Still, it’s an impressive sign of where monitors are heading. The Dell UP3218K UltraSharp 8K monitor is an incredibly impressive monitor, and while it definitely won’t be for everyone, in some ways it feels like it’s giving us a sneak peek at the future. Its biggest selling point by far is the huge 8K resolution, which equates to 7,680 x 4,320 pixels. That’s a massive leap in resolution for most of us, who are just about considering the upgrade to 4K (3,840 x 2,160), and are currently using 1080p (1,920 x 1,200) or 1440p (2,560 x 1,440) displays. So is an upgrade to 8K desirable for most people? Straight off the bat we should say that this monitor (and any other 8K monitor out there, although there aren’t many) probably isn’t aimed at you, unless you’re a professional photographer, video editor or graphics artist. There's very little 8K content out there at the moment, and many games and applications aren’t designed for such a high resolution – and if they are, you’ll need quite a powerful PC to run them at full 8K. However, if you need to work with very high-resolution images, or you’re interested in what the future holds for monitors and can afford the price tag, then the Dell UltraSharp UP3218K could appeal. As with other screens in Dell’s UltraSharp range, the UltraSharp UP3218K is aimed at professionals, with PremierColor technology that meets many industry standards. Coupled with the huge resolution and large screen size, you wouldn't expecting this to be a cheap monitor. So, what’s the damage? In the UK the UP3218K is available from Dell’s online store for £4,114.56. Meanwhile, the US Dell store has it on sale for $3,899.99 – a much more reasonable price considering the exchange rate, although still very expensive. In Australia, meanwhile, the price hits AU$5,000. This isn’t a monitor you’re going to buy on a whim, then, but if your work depends on accurate colors, and you need a large and high-resolution monitor, the price may be worth it. Even switched off the Dell UltraSharp UP3218K is a good-looking monitor, with tool-free assembly that means it's quick and easy to securely attach the screen to its base. The base and neck of the monitor are made of durable-feeling brushed aluminum. The screen is large at 32 inches, but compared to many of the ultra-wide monitors we’ve had in recently, like the Alienware AW3418DW from Dell’s gaming brand, it doesn’t take up quite as much desk space as we’d feared. There’s no denying, though, that this is still a large monitor that will dominate your work area. With the screen attached to the base it can be adjusted 120mm vertically, and swiveled 60 degrees. The screen can also be rotated 90 degrees to switch between landscape and portrait orientation – very useful for image-editing. Slim bezels around the sides of the screen help to keep the overall size of the monitor down. There's a small Dell logo in the center of the bottom bezel, with buttons for navigating the onscreen menu located on the underside at the bottom-right. Also along the underside of the screen, towards the back, are the power connector, two DisplayPorts, and audio line out port, a USB upstream port and two USB downstream ports for using the monitor as a USB hub. If you think that’s a slim selection of ports, with none of the HDMI, DVI or VGA ports usually found on monitors, it’s because none of those will be able to handle 8K resolution at 60Hz. In fact, the two display ports both need to be plugged into the same graphics card for the monitor to display at the full resolution. So, don’t expect to plug a wide range of devices into the Dell UltraSharp UP3218K. You’ll also need to make sure you have a graphics card that has two DisplayPorts. Modern, powerful graphics cards usually do – and you’ll need a beefy GPU to make use of this monitor. Overall, the design of the UltraSharp UP3218K makes it an eye-catching and stylish addition to your workspace, and Dell’s reputation for making quality products is on show, with a solid build quality that makes this monitor look and feel like the premium product it is. Straight out of the box the Dell UltraSharp UP3218K impresses, with the Dell PremierColor color coverage (which has 100% AdobeRGB, 100% sRGB, 100% Rec. 709, 98% DCI-P3 industry standard compatibility) showing what the monitor’s color depth of 1.07 billion colors can achieve. The monitor is factory calibrated, so it looks great without any tinkering. Windows 10 also did a good job of identifying the 7,680 x 4,320 resolution, and set the scale and layout to 300%. Windows 10 is known for scaling well at high resolutions, and it’s good to see that it manages to do so at 8K as well. The 300% scale is a good choice as a default, as going to 100% makes the Windows 10 interface too small to use comfortably. Meanwhile, 225% is a good compromise if you want a useable interface but also want to make full use of the huge resolution. While Windows 10 works quite well in 8K, many apps and programs haven't been designed to work at those kinds of resolutions. This means you may see buttons or text that look either too small, or too large, as programs struggle to display in 8K. Most of them still work, but this lack of 8K support does show just how far ahead of its time the Dell UltraSharp UP3218K is. We’re also a long way off from 8K content being mainstream, although there are 8K videos out there. YouTube, for example, has a range of 8K videos, and while streaming from YouTube won’t give you the ultimate quality when it comes to 8K content, we have to say that playing some of the 8K videos on the UltraSharp UP3218K was seriously impressive. The ultra-high resolution, along with the color handling of the monitor, made the footage look incredible, and at some points the effect was almost 3D thanks to the detail on display. It's definitely a step up over 4K, and just seeing some of those videos could be enough to make you start saving up for the UltraSharp UP3218K. But 8K footage is still thin on the ground, and for the most part it's simply demo footage that shows the potential of the standard – so don’t expect to watch 8K TV shows or movies just yet. From what we’ve seen, though, 8K video is going to look amazing, and if you have the UltraSharp UP3218K you’ll be able to take advantage early on. It’s worth noting too that we were streaming 8K footage using a very fast internet connection (700Mbps), using a PC that has a Titan Xp graphics card; weaker hardware and slower internet speeds may not be able to handle 8K footage. Meanwhile, 4K footage also looks very good on the Dell UltraSharp UP3218, and 1080p footage isn’t too bad either. Photo editing will be the main reason why many people might consider purchasing the UltraSharp UP3218. We viewed 8,256 x 6,192 (51-megapixel) photos on the monitor, and it proved to be a wonderful showcase for the images, showing off details (such as a thin cobweb hanging from a flower) that lower-resolution monitors might not reveal. Color rendition was also very impressive, with the monitor delivering life-like colors that really added to photographs. For professional photographers or digital artists, the Dell UltraSharp UP3218 is a wonderful tool that could be well worth the investment. While this is in no way a gaming monitor, we wanted to see how well it could handle games at 4K and even 8K resolution. This was more out of curiosity than anything else, as hardly any games will have art assets that stretch to 8K resolution, and even with the epically powerful Nvidia Titan Xp graphics card on board our desktop machine we had our doubts. However, we were pleasantly surprised, as we were able to run Wolfenstein II at 8K on the highest graphical settings and getting 24 frames per second. That’s a far cry from the 120FPS or above speeds we were getting at 1080p with the same setup, and while image quality was impressive, it wasn’t enough of a leap over 4K to justify the performance hit. However, this was at the highest settings, and with a bit of tweaking we’d probably be able to get a playable 30FPS at 8K – but this is on a very powerful (and expensive) PC. With graphics card power continuing to make strides, though, it may not be as long as we'd feared before games can be routinely played at 8K. It’s worth noting that after a while the Dell UltraSharp UP3218 does become quite hot at the top of the body of the screen, even when you're doing relatively simple tasks. It’s a side-effect of having to push so many pixels, but it’s not much to worry about, and it didn’t impact our use of the monitor. Overall, the Dell UltraSharp UP3218 provides stunning image quality, albeit image quality that won’t be of much use to many people other than professionals or enthusiasts who want cutting-edge technology. If you’re one of those people, then this will be an indispensable tool that offers amazing visuals. For the rest of us, it’s an encouraging indication of where monitor tech will surely go. There's no denying that the Dell UltraSharp UP3218 is capable of stunning image quality. The factory settings make it a visual treat right out of the box, and if you take some time to configure it this is a superb monitor for photographers, video editors and digital artists. The 8K resolution is impressive, revealing details that lower-resolution monitors are likely to miss. Let’s be honest – the extremely high price tag means this is a monitor that should only be considered by professionals, especially given the lack of native 8K content out there. And even if you are a professional, you may still find that you can't justify the price when very good 4K monitors are becoming ever more affordable. 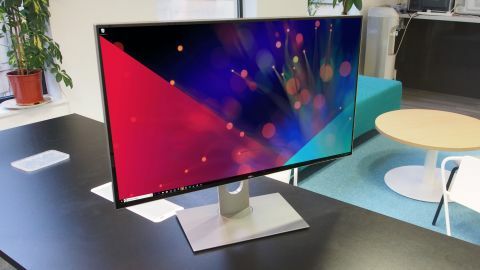 When judging the Dell UltraSharp UP3218 you have to bear in mind that this is a monitor aimed at professionals such as photographers and video editors, and not at mainstream customers. The extremely high price, and the fact that many of its high-end features won't be compatible with mainstream applications for perhaps years, mean that no matter how desirable this monitor may seem, you should think long and hard about buying it. If you are a professional photographer, designer, editor or someone who needs a monitor that can display incredibly high-resolution images with bright, vibrant and, above all, accurate colors, then it's well worth the investment. It’s recently been announced that Adobe Photoshop has been updated to support 8K displays, so if you want to get yourself a future-proof monitor then the Dell UltraSharp UP3218 is the one to get – but expect to pay a lot of money.